Jeddah Tower (previously known as Kingdom Tower, is being built in Jeddah, Saudi Arabia, at a cost of SR4.6 billion (US$1.23 billion). It is on track for completion in 2020 as planned and will be over one kilometer in height. As of 25 January 2018, 60 floors have been completed, and the central core containing elevator shafts and stairwells has reached level 66. A later design for the foundation, to be constructed by Bauer in 2013, calls for 270 bored piles up to 110 m (360 ft) deep which have to be installed into the difficult ground conditions. Some materials needed for the structure are 500,000 m3 (18,000,000 cu ft) of concrete and 80,000 t (79,000 long tons; 88,000 short tons) of steel. 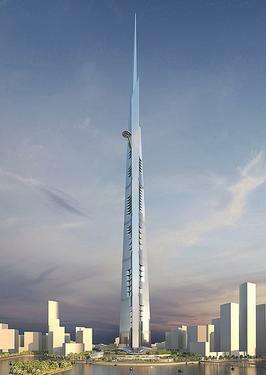 Construction of the building will rely on cutting-edge technology, including the high-strength reinforced concrete and the pumps used to elevate it to record heights, similar to what was used during Burj Khalifa’s construction. Bob Sinn, principal of Thornton Tomasetti states, “Concrete quality is getting better and better, as is pumping technology. There have been very strong advances in reinforced concrete over the last 20 years.